Uncover the jewels of northern India and the majestic Himalayas on this luxury private tour. 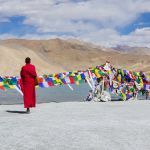 Amble in the surreal landscapes of Leh, Ladakh and Nubra Valley, surrounded by incredible Mountains and dotted by charming monasteries and villages. 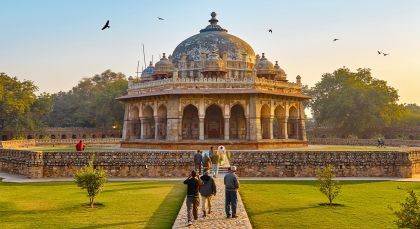 From sparkling, high altitude lakes to the Shangri-la experience at stark, scenic valleys, this India vacation offers the perfect mix of heritage sites, unique natural wonders and adventure! 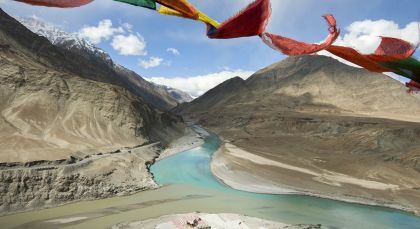 Ladakh: The land of endless discoveries! Bound by two of the world’s mightiest mountain ranges, Ladakh is gifted with high mountains, lakes and beautiful ancient Buddhist monasteries. Experience spectacular Himalayan landscapes as you trek through mountain passes, high-altitude villages, narrow valleys and gurgling streams. Drive up from Leh to the trek head at Zingchen Village. From the village, trek up for about three to four hours through mountain valleys and alongside streams to reach the much larger Ladakhi village of Rumbak (3,700 meters). During winters, the village is well-known for sighting the elusive Snow Leopard. After a long and adventurous day of trekking, bed down at a comfortable Rumbak homestay for the night. Next morning, following a hearty breakfast washed down with Tibetan butter tea, set off for Stok La pass (4,900 m), trekking for about five to six hours. From the top of the pass, admire the breathtaking panoramic view of the Stok village below and the Stok range, including the Stok Kangri (6,123 m) peak, surrounding you. Trek down gently to Stok Village, your pick-up point for Leh. (1Night/2Days Trip; Private Activity & Transfers; Meals included: All Meals; Fitness Level: Easy; Please bring comfortable trekking boots, comfortable clothes; and don’t forget your camera or binoculars; Note: You can also return to Zingchen Village from Rumbak and drive back to Leh). Khardung La, the highest motorable road at 5600 m, Diskit Monastery, headquarter of Nubra Valley, Hunder, Bactarian double-hump camel ride, Panamik hotsprings. 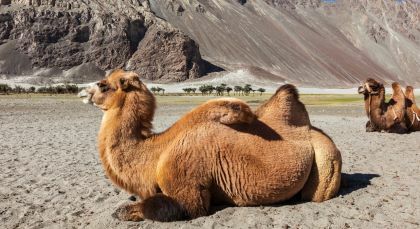 Explore the starkly beautiful Nubra Valley, dotted with monasteries and ruined, ancient structures, on this trip to Diksit. This little town functions as the transit hub of this sparsely populated part of India, home to the legendary Diksit Gompa. Drop by the mysterious Diskit Monastery, which was built between the 14th–17th centuries. Perched atop the old town of Diksit, at first sight this ancient Gompa seems to be precariously balanced right at the edge of a sheer rock face. Built in the classic Tibetan style, it is definitely worth a visit. Among its many cultural and artistic appeals is a mysterious, six-armed statue. It stands within the Gonkhang (chamber of the guardian deity) and has an interesting story for you to find out! Alchi village lies in the Leh district of Ladakh in Jammu and Kashmir, situated on the left bank of the Indus River, 7 km downstream from the capital of Leh. Located on the banks of the Indus River, the sleepy village of Alchi is home to one of the oldest Buddhist monasteries in Ladakh. 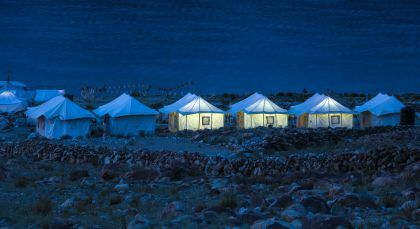 Just 70 km from Leh, Alchi offers many a modern amenity for overnight visitors. 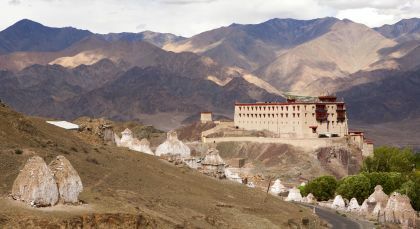 The village’s claim to fame however, remains the Alchi Gompa or monastery – a beautifully preserved heritage site which was built around the 12th century AD. Ancient and carefully preserved Indo-Himalayan style paintings, dating back several hundred years, adorn the walls of the monastic complex. A glittering jewel amongst the many monasteries of Ladakh, Alchi Gompa is also a centre for Buddhist studies. Take a leisurely trip to the 14th century Spituk Gompa (monastery) and haggle for the best bargains at the bustling bazaar. Just half an hour away from the city center, the Spituk Monastery stands majestically perched on a hillock. Explore the intricately worked traditional Thanka paintings and murals on its walls. You could also climb higher up the hill to a chamber that houses a statue of the Hindu Goddess Kali with her face covered. It is unveiled only once a year. Enjoy the splendid view of the Indus Valley and the Spituk Village below. Give yourself over to some Tibetan-style retail therapy next with an amble in the bazaar. Shop for souvenirs and sample Ladakhi fare at the numerous teashops and local pizza places dotting the marketplace. The beautiful Pangon Lake, which sits high up in the Himalayas at a stunning altitude of 4350 meters, is quite popular with tourists from all over the world! 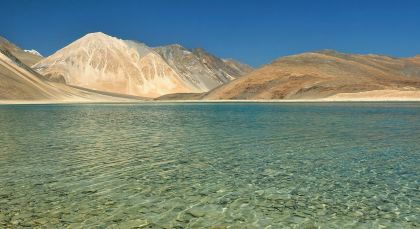 The Pangong Lake sits high at a mind-boggling altitude of 13,900 ft. Ringed by a rocky shoreline, the calm lake certainly lives up to its name – ‘Pangong’ is derived from the Tibetan word Bangong Cuò, meaning ‘long, enchanted lake’. A narrow strip of land extends into the saltwater lake and is quite the favorite with visitors! You can see a large diversity of migratory birds at the lake, like the Brahmani Ducks and rare black necked, and the curious Ladakhi Marmots – large rodent-like animals. The area also offers plenty of opportunities for trekking, hiking and mountaineering. Enchanting Travels supported us with care and understanding in developing a memorable trip itinerary. From the moment we landed in India till our departure we were fully supported with excellent travel guides and support staff. We would recommend Enchanting Travels at any time.